The Toyota Prius has been a leader of the hybrid movement for almost 20 years, bringing this once rare piece of automotive technology into the mainstream. This model year, the Prius is carrying over most of its features and equipment, though drivers will be happy to find a new plug-in option is now available: the Prius Prime. Keep reading our full 2017 Toyota Prius review to find out more! 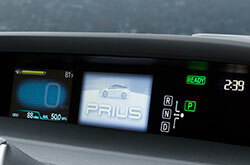 There is a wide variety of features and amenities on the 2017 Toyota Prius in Evansville, including four separate Prius models (standard, Prius C, Prius V and the new Prius Prime). 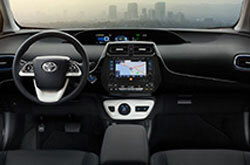 The main Prius model offers standard features like 15-inch alloy wheels, a tilt-and-telescoping steering wheel, Bluetooth connectivity, dual 4.2-inch driver information screens, LED lighting, keyless entry and heated mirrors, just to name a few. Standard features on the Prius C include everything from 15-inch steel wheels, automatic climate control and a 6.1-inch touchscreen to voice commands, a four-speaker sound system and a folding rear seat, while the Prius V wagon gets 16-inch alloys, cruise control, a six-speaker sound system, keyless ignition and entry, and a fold-flat front passenger seat. Finally, the all-new Prius Prime model should come with different lighting features on the car's exterior, as well as a carbon-fiber hatch and an 11.6-inch table-style center display screen. There are multiple green powertrains on the 2017 Toyota Prius in Evansville, depending on the model you choose. 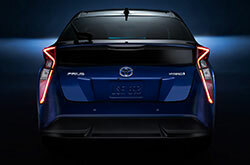 The standard Prius is powered by a 1.8-liter four-cylinder that is paired with electric motors and generators, creating around 121 horsepower. The Prius C works off of a 1.5-liter four-cylinder, electric motor and nickel-metal hybrid battery pack combination that is paired, like all Prius models, with a continuously variable transmission (CVT). 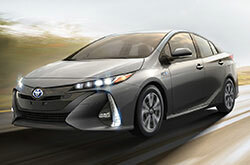 The Prius V gets a slightly more powerful hybrid powertrain than the standard model, producing 134 horsepower, while the Prius Prime takes advantage of a new plug-in displacement that combines a larger battery pack with a gas/electric motor hybrid system, which gives the car a very impressive 600-mile estimated driving range. The Prius' multitude of exciting features and powertrains aren't the only things that 2017 Toyota Prius reviews have praised. The car's standard safety features have also been big highlights, which include everything from antilock disc brakes and full-length side curtain airbags to a passenger seat cushion airbags and front side airbags. 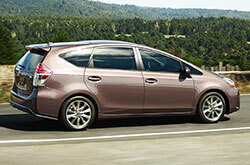 Visit us at Kenny Kent Toyota to take the latest edition of the Toyota Prius for a test drive today! In the market for the 2017 Lexus CT, Chevrolet Volt, Honda Civic Hybrid and the Ford C-Max? You should also visit Kenny Kent Toyota to take a look at the handsome 2017 Toyota Prius and find out why it's a commendable option. The car's opulent on-board technologies and attention-grabbing styling could wind up being just what you seek from a daily driver. Take advantage of our report to see if the 2017 Toyota Prius is right for your express needs. 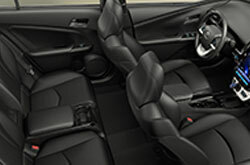 Also take a peep at the latest exclusive dealership offers available at Kenny Kent Toyota! As your in-town Toyota franchise, we're the destination to find financial incentives on the Toyota Prius, as well as other new and quality pre-owned vehicles. When making your final buying decision, we hope our 2017 Toyota Prius review offers the specifications you need to make an informed purchase. We have many Toyota Prius models for sale in Evansville, IN; stop by to benefit from a test drive - setting up an appointment ahead of time is easy. Also, before your visit, you can see its classy design from all sides by viewing our video recording.